Blowguns are powerful defense tools and great fun also. Below are the sizes and accessories for them. these are not toys , but the real thing. You can expect ranges over 250 feet and muzzle velocities as high as 350 feet per second or more! In fact, the darts can penetrate 1/4" of plywood with no problem! 100% USA Made. Each blowgun comes with 12 target darts, mouthpiece, muzzleguard, foam grip and two dart quivers. Comes in six sizes from 18 inches to 72 inches. Be sure to get those extra's You WILL want them sooner or later!! You may also wish to add an optional paintball magazine quiver set to your blowgun. 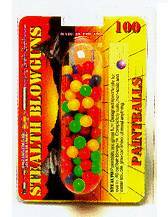 The magazine set allows you to carry up to 80 paintballs on your blowgun. The Splatmatic accessory transforms any .40 caliber blowgun into a semi-automatic paintball gun. Remove your mouthpiece and attach the splatmatic to the tube. 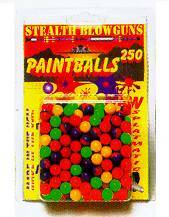 You can load up to 20 paintballs into the tube supplied with the splatmatic. Every time you press the button, one paintball will load into the barrel. Compatible with any of our blowguns. $15.00 Be sure to get those extra's You WILL want them sooner or later! !